Günther Ramin is both a musical and historical legend in Germany today. His tenure as Cantor of Bach's "old church", St Thomas' Leipzig, from 1940 to 1956, spanned one of the most difficult periods in Germany's recent history, to which Ramin responded with musicianship, enthusiasm, conviction, loyalty and persistence. Founded in 1212, the choir has maintained an unbroken tradition despite the vagaries and vicissitudes of religious, city and national politics; it has always been associated in Leipzigers' minds with their deepest cultural and religious traditions. Probably uniquely in Germany the boys live-in, studying, relaxing, playing, and of course singing together. Some ten to twelve boys of mixed ages board together in a "Stube". A Thomaner from the 12th (the oldest) Class acts as "prefect" and is responsible for the good order and welfare of his group. It is a long Thomaner tradition, that the oldest are responsible for their younger colleagues. There is a measure of friendly rivalry between the "Stuben" in their regular football matches; a major yearly event is the match between the Thomanerchor and the Dresdner Kreuzchor! With the advent of mass transportation in the early 1920s Leipzig began to find itself sharing its choir with an ever-widening circle of European musical centres, providing a new challenge for the then Cantor and Ramin's teacher, Karl Straube. Following extensive choral conducting experience during the 1920s and 30s, in addition to being Organist at St Thomas' since 1918, Ramin was appointed Cantor on January 1st 1940. The choir managed to survive the war, and in 1945 began, like the rest of war-torn Europe, to rebuild. There was little food to be had, and Ramin started a fund to support the choir. He would go on foraging expeditions, returning perhaps with salted herrings, or a supply of codliver oil, a spoonful of which was administered to each boy at breakfast. 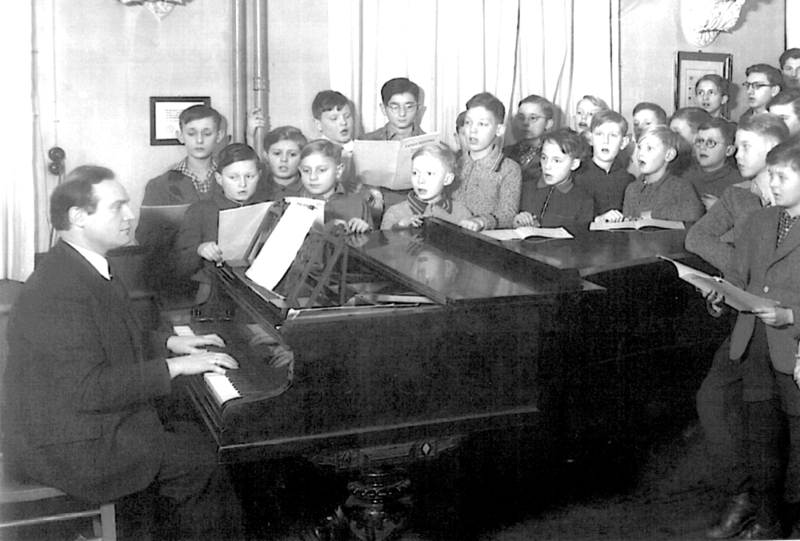 In 1948 the choir made its first trip abroad, being invited to an international youth-choir gathering in Bern and other engagements throughout Switzerland. At first the concerts were not particularly well attended. Then the choir gave a concert in Geneva, during which several of the boys became ill and were forced, ashen-faced, to leave the stage. Those remaining looked thin in their sailor suits and short pants, with thick woolen stockings to keep them warm. The local newspaper gave a heart-rending review of these "poor, half-starved little choirboys"; thereafter the good-natured Swiss rallied round and every concert was a sellout. But as one of their number recently recalled, they were not sick from hunger, but from a surfeit of rich Swiss cream the like of which they had never tasted in their lives! A distinguishing feature of Ramin's interpretations is the sharpness and clarity of the boys' voices. Ramin's practice of rehearsing each part separately ensures that the four parts, S A T and B, are all equally and clearly audible, each section of the choir infused with an awareness of its own individual contribution and value, giving a depth of dimension to the sound. Another outstanding feature is the choir's diction - Ramin always insisted that every single word must be clearly audible and distinguishable. In stressing the texts themselves and the clarity of enunciation, Ramin was reflecting Bach's own view. Bach was deeply religious. He knew his Bible thoroughly and his family Bible was well annotated in the margins. One can always tell when Bach feels particularly strongly about a specific text or biblical injunction, for he gives it the special treatment of an outstanding choral introduction, or perhaps a variation on each verse of the appropriate chorale running throughout the cantata's movements. Ramin (like his pupil Karl Richter), brings a particularly strong spiritual insight to his interpretations, stressing the text and bringing out significant phrases. Indeed without such spiritual insight Bach's music becomes empty and meaningless. Unfortunately today, spiritual insight is frequently - and quite erroneously - confused with romanticism and rejected accordingly. This may explain why so many of today's renditions are superficial, aiming not to recreate a musical-spiritual experience but, in the words of John Eliot Gardiner, "to excite modern audiences". Here too may lie the explanation for many of today's breakneck tempi, so far removed from the religious devotions of an 18th century Leipzig congregation. The division of Germany in 1946 posed a major challenge for Ramin, as for anyone and any institution connected with religion to which the strongly secular Socialist State was fundamentally opposed. Working within this challenging environment, Ramin is remembered for his loyalty and persistence, his loyalty in remaining with his Leipzig choir after despite numerous tempting offers from the West, and his persistence in keeping the choir alive, visible and audible through two dictatorships, Nazi and Socialist, fundamentally different ideologically yet identically antagonistic towards religion. In 1945 most of Germany was in total ruins. From the war's end until 1950 both Germanys were struggling to rebuild. Then as the 50s progressed, the weight of oppression and economic stagnation settled over East Germany in a cloud of depression; music was the people's lifeline to sanity and they clung to it desperately. The few visiting foreign choirs were received with tearful acclaim, and for all musical events large and small, the lineups would often form several hours in advance. It was against this background that East Germans tuned in at 11.30 on Sunday mornings to the hear boys and men of Ramin's Thomanerchor who dared to sing Lutheran cantatas and somehow managed to get away with it. These broadcasts were authorized and recorded by the SRK (Staatliches Rundfunk Komitee of the DDR) between 1947 and 1956. Ramin managed to convince his political "masters" that the Thomanerchor was a major potential foreign currency earner, perhaps the only way to win some small support from the political regime. But political support was provided only on strictly limited conditions. The choir was rehearsed during the week without orchestra, to be joined by the Stadt- und Gewandhaus-Orchester and soloists for the Divine Service on Sundays. This served as the only full "rehearsal" for the recorded performance which followed immediately. The performances were taped at 30 inches-per-second (giving a significant improvement in quality over the normal professional speed of 15ips) and the tapes were then taken directly to the studio for broadcasting. The "privilege" of re-takes and editing was not permitted by the SRK; each cantata was, as one old Thomaner remembers, "an all-or-nothing" performance.... and the world would be listening with high expectations. This sense of pressure and importance may help to explain why many of the performances could only be called electrifying. Despite the politically imposed limitations, with a few exceptions the general technical standard was excellent, and the broadcasts were regularly picked up by western stations. The SRK used several high quality condenser microphones, the only problem being that overcrowding in the Organ Gallery of the Thomaskirche where the recordings were made often left little space for microphone stands. The first, and indeed the most important element in the recording "chain" is the microphone, and here too hangs an interesting tale. In 1927 Georg Neumann pioneered the high-quality condenser microphones used by all professionals, and his company has subsequently been responsible for the development and manufacture of some the world's finest professional microphones. In 1943 Neumann's Berlin factory was bombed; Mr. Neumann took his car and went south to find a place outside the allied bombers' flight-paths. The allied bombers dropped a material somewhat like Christmas-tree "tinsel" to confuse the Germans' radar and deflect their anti-aircraft defenses. Mr. Neumann was searching for a place without any traces of this "tinsel", and he found it in a little village called Gefell, just three miles on the "eastern" side of the Bavarian border. Here he set up shop in a vacant textile mill. He was not to know at the time, but by establishing this sister-factory in what was to become the DDR while retaining a presence in (later West) Berlin, Mr. Neumann was to ensure that both East and West would benefit from his pioneering technology. The high-quality "Neumann/Gefell" studio and broadcast microphones made in the DDR were distributed throughout the Eastern Bloc. Most of the microphones went into the broadcast systems and recording enterprises, to be used for example by the DDR recording company Eterna, and by the Russians for their MK and Melodyia recordings. Another Neumann/Gefell model went into the public address systems; virtually every town hall and auditorium in the former Soviet Union has one. It was Günther Ramin's custom to review in advance the full scores of the several cantatas appropriate to a particular Sunday and to play them through on the piano, then making his personal selection. Were his choices influenced by the political conditions of the time? If they were, he would surely not have made any such admission. Yet when one follows the texts with the political conditions and the recording date in mind one cannot help wondering, for so many of the chosen cantatas reflect despair or a cry of hope. For example BWV 131 "Aus der Tiefe" - "From the Depths we call to thee"; and BWV 106 "Gottes Zeit" - "God's Time is the Right Time", were both so magnificently and intensely sung, and these performances must surely have been motivated by the prevailing political and social conditions. From a different point of view, another cantata performed by the choir was "Preise Jerusalem", BWV 119. Ostensibly it is an outgoing piece, composed for the 1723 City Council Election. The text is politically innocuous in its praise for the city of Leipzig and its fortunate inhabitants. Yet at the heart of this work is a key aria in which the unknown librettist warns that "authority comes from God, and he who fails to give it due measure fails to fulfil the will of God." This cantata was broadcast in January 1953, the year of the East German Uprising. You can hear and download several Ramin-conducted cantatas through our Baroque Music Library. Many who lived through and remember life in the DDR look back on Ramin's Sunday broadcasts as a life-saver which helped them to survive spiritually. Never before have words and music, politics, poverty and oppression been so closely inter-linked. The editor acknowledges with gratitude the many valuable personal recollections contributed by Gunther Ramin's son, the late Dr Dieter Ramin. for a complete listing of all our Baroque Music sites.